Rev. Teddy Parker, age 42, a pastor in Macon, Georgia, committed suicide by a self-inflicted gunshot wound at his home on a Sunday morning while his congregation and family waited for him at church to preach. The pastor had apparently struggled with depression and was on medication. In an article in churchleaders.com author Tony Ridgaway quotes a close pastor friend of his, Dr. E. Dewey Smith Jr.
“He needed to take a break from ministry and the way our culture is, the culture forbids that. How much do you share? How much grace do people allow?” he explained. “It’s hard to be honest. It’s difficult for some preachers to be honest. Every pastor needs a pastor to kind of lead and guide them. But it’s hard for us to really find that relationship because often pastors are trying to compete with or cremate you. And so it’s difficult to find camaraderie,” Smith added. The tragic ending of Rev. Parker’s life and ministry is a reminder to all of us how fragile our own hearts and souls are and that we pastors need the help and support of others, particularly other pastors. We’ve probably all preached or taught on Galatians 6:2, “Carry each other’s burdens, and in this way you will fulfill the law of Christ,” but for some odd reason can exempt ourselves from carrying out Paul’s admonition. I’m grateful for having been part of a pastor’s accountability group for the last 20 or so years of my ministry. We were a group of guys numbering between three to seven in our group (the group changed in members and in size over the years). We were committed to confidentiality, a high degree of openness with each other, and being supportive of one another. We laughed and we cried together. We were good for each other’s heart and soul! I’d strongly suggest any pastor finds or creates such a pastor’s support group. I’d also argue that you can’t have such support within your own denomination or church network; there’s just too much of a temptation to try and look good with such a group of professional peers. One of our responsibilities as pastors is to model the kind of honesty and openness that we expect among our parishioners. I know, there’s limits here, but our congregations need to know that we’re human too. The times I’ve tried to be a bit transparent with my congregation they have expressed relief that I too have struggles. What we need is heart-to-heart ministry where we open our hearts up more to the hearts of other pastors and even to the hearts of our own congregation. 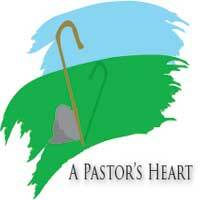 This blog is called A Pastor’s Heart, and that heart needs to be shared with others more than it often is.